Beers with a not-so-subtle wink and nod to marijuana are nothing new; after all, hops and marijuana are related in certain molecular ways. (Notably, both contain terpenes, which are responsible for similar aromas in hops and cannabis.) But brewers have lately entered a sort of arms race to see just how much dank weed aroma they can pack into their beers. So, hemp and beer and marijuana are all palling around together recently, and the latest result of their friendship is a new SweetWater IPA called G13, first released on draft two months ago. 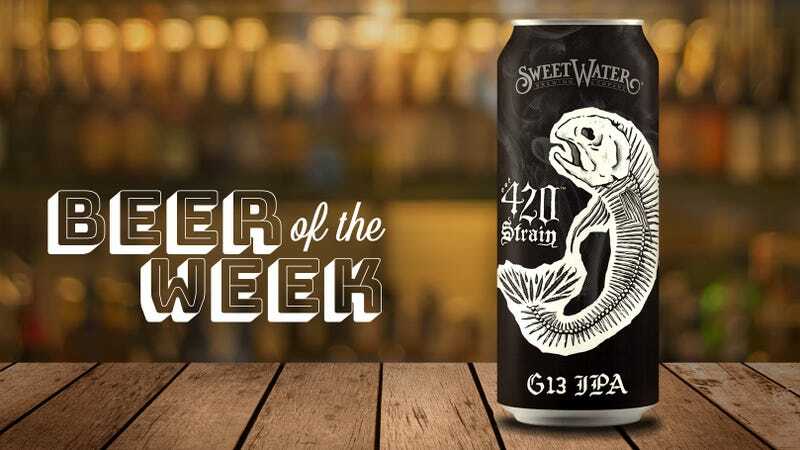 Atlanta-based SweetWater is no stranger to weed-adjacent brews, naming two of its flagship beers 420 Extra Pale Ale and Hop Hash. But G13 is something new for the brewery: It marries Simcoe and Columbus hops with “botanically sourced, strain-specific” terpenes to create aromas mimicking “the legendary G13 cannabis strain.” This beer isn’t just supposed to remind you of weed, it’s supposed to remind you of specific weed. 2018, you certainly have your moments. What surprised me about this beer, though, is that it’s not just about the dank-sticky-supergreen notes. It actually marries those aromas with a lot of hop-derived stone fruit, berry, and white grape elements to create a delightful, bright IPA that doesn’t only smell like a college dorm room. The aroma especially delivers peach, strawberry and white grape scents overlaid on a grassy, bright cannabis canvas. The flavor also marries the best of both fruit and weed, with resin and sticky onion tones upfront yielding to just-ripe pineapple and nectarine sweetness. The sip closes with clean but rather moderate bitterness, a nice in-between level that makes for an easy swallow. If the beer’s branding didn’t knock you over the head with 420 references, you might not even pick up those terpene contributions. So if weed isn’t your mood-altering substance of choice, don’t let that keep you from trying out this mighty tasty new IPA. SweetWater G13 is available across the brewery’s 22-state distribution, which stretches from Florida up the East Coast and west to Texas. See exact locations where SweetWater is distributed here. Have a beer you think should we should consider for inclusion in an upcoming Beer Of The Week column? E-mail details to beer@thetakeout.com.